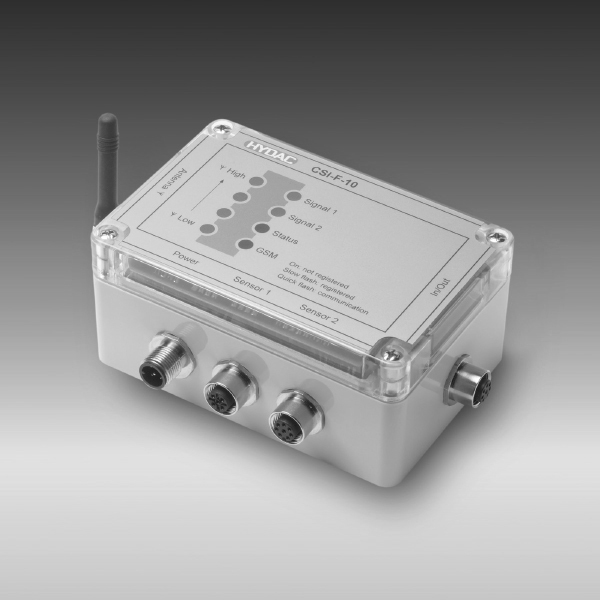 The GSM communication module CSI-F-10 is an all-purpose electronic instrument. It transfers data and digital signals via the GSM mobile communication network. What’s more, as part of the HYDAC Condition Monitoring concept, the CSI-F-10 links the sensor level with the interpretation level. Therefore, the device is for both standalone operations and for use as a GSM modem on a CMU 1000 (HYDAC Condition Monitoring Unit). Moreover, the connection of up to two HYDAC SMART sensors such as HYDACLab®, AS 1000 or CS 1000, to its input sockets, is possible. In addition, it is also possible to monitor various different system conditions via the four integrated digital inputs. Then, we need to relay the data in binary form with the aid of the two integrated digital outputs. Via these digital outputs, the device can also directly access the machine/system being monitored. Furthermore, the CSI-F-10 processes and monitors the input signals using the application program stored in it. The program defines in detail the monitor of specific data, and how, and at what point a particular message is to be given. The creation of this application program can be easy and convenient (in accordance with IEC 61131) use the CM Editor. Note that this CM Editor forms part of the HYDAC PC software CMWIN Version V03 or higher. Depending on the application, the user can choose independently between two operating modes of the CSI-F-10 and hence define the type and content of the communication.